Throw away the traditional paper sticky notes and start using the powerful and unqiue Efficient Sticky Notes! “Stick” your notes on the desktop and you can read important information at any time on the screen. It saves your money and saves your time! The software allows various background colors, with optional gradient effect, to be set for the desktop notes. You can also customize the font of each note and set it to be semi-transparent so it will not fully cover up your desktop background or icons. To fully protect your privacy, the software encrypts the login password with the irreversible SHA algorithm and also encrypts data files. Besides, it offers various special features such as managing sticky notes by group, setting note importance, tracking the creation time and last modification time of desktop notes, adding attachments to notes, Recycle Bin, etc. So…it does not hurt to make a try right now. You will love her! 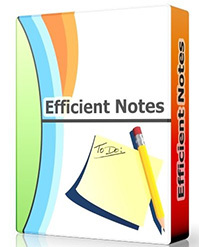 Why Choose Efficient Sticky Notes? To meet different requirements from our friends, we provide a professional edition together with a free edition. You can “stick” information on the computer desktop directly! At a glance you can see the information that is important to you. The portable edition is designed to run from a USB flash drive. Now, with the USB drive, you can manage your sticky notes on different computers (such as one at home and another at work), and do not need to worry about data synchronization! Efficient Sticky Notes has powerful search capabilities so you can quickly find your information. There is a Recycle Bin in this sticky desktop notes software, you do not need to be worried that you may delete some important information by mistake. The functions of Backup and Restore can help you conveniently save and migrate data.